Google Photos remains one of my favorite Google products. Unlimited free photo uploads (at a capped resolution), easy organization, automatic tagging, the list of features goes on and on. Google Photos is rolling out two new features today that improve sharing and automatic video creation. There are two ways to currently share images in Google Photos. The first option is to create a link to the image(s) on Google Photos, which can then be shared through other applications or copied to the clipboard. The other is to directly share the images to any app on your phone through the Share menu. Not terribly intuitive, especially as the list of applications on Android that can accept images is extensive. Google Photos now features a redesigned Share menu, placing people in your contacts at the top, and apps (and the button to create a link) below. 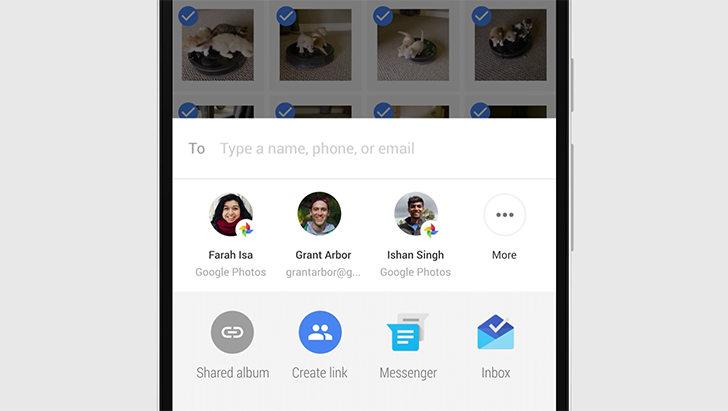 If the given contact has the Google Photos application installed, the recipient will receive a Photos notification to view the pictures. If only an email address or SMS number is available, a link will be sent to view the pictures. The new sharing functionality was hinted at in our Google Photos 1.27 APK teardown, and the name "SendKit" indicates we may see this functionality in other apps. Google will be rolling out more Movie Concepts in the near future, including ones about summer memories and formal events (such as weddings). As always, these videos are auto-generated.